Be it winter, spring, summer, or fall – each one has its own tone, own feel, and own color to it. Now that spring is here, people welcome the beginning of the latest fashion trends as well. Now, who wouldn't be excited for the new Vera Bradley color patterns this 2014? This Vera Bradley Spring collection gives your wardrobe a splash of color with hues such as: Blue Bayou, Citron, Julep Tulip, and Clementine. This just shows that no matter how long the white winter is, spring is sure to brighten up your days. These colors will make one stand out from the crowd. Nothing is so easy and pleasing to the eyes as spring. It's like nature's way of telling people that there's a new life blossoming and better days are ahead. First in line in the 2014 Vera Bradley Spring collection is Blue Bayou which mainly consists of pretty blue and white floral patterns. This is the perfect symbol of the end of a gloomy winter as it blossoms into spring. 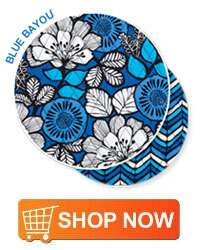 This simple white flowery pattern stands out from the royal blue background with a black, intricate design. 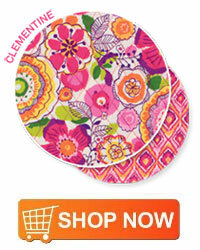 Soothing and appealing to women of all ages, this pattern can go well with almost anything! This pattern is so elegant with all the corners and pointed lines. 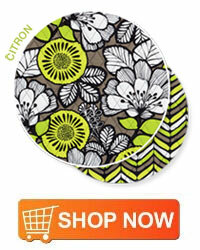 Next up in the new collection line is Citron with a zigzag, geometric, and flowery pattern quite similar with Blue Bayou. But unlike the calm color of the latter, this one's got to be one of the boldest colors this season. It's a mix between yellow and green, bordering on neon. The color instantly pops out even from a distance. It's a reminder that's summer is already coming! The contrast between two colors albeit the similar structure is really nice, giving any girl the option to choose what best suits her mood. With the right amount of brightness, floral Clementine can easily lighten up the mood as the colors look fruity and sweet. Just like any citrus fruit, this bold pink and bright orange number gives an interesting twist and flavor to any outfit. The yellow and green details make the floral patterns glow even more. It's the kind of pattern that can easily put a zing to any outfit. With this, you do not need to pile up on accessories or wear funky clothes. Wearing plain and basic clothes will look so much better with this since it will emphasize the richness of the colors of this particular pattern. Clementine balances things out, making it perfect for the season. 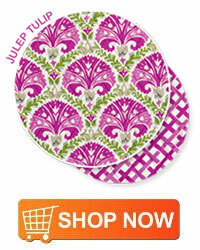 If you're a girly-girl, then Julep Tulip is just right for you. The lovely hot pink and apple green color combination complements each other really well. Though both colors look good combined, each one stands out as well. Unlike the first two with sharp patterns, the designs for this one are curvier and much softer. It is the perfect pattern for spring as one will surely think about gardens with pretty blossoming flowers. The design is so delicate and feminine, just right for those who are into dainty clothing. You may opt to pair this with hues similar to it. You can give it an edgier look by pairing it with darker tones. Nowadays, people are more fashion forward. Even younger ones are not afraid of taking risks. They are definitely bolder than the generations before them. But, there are certain pieces that you need not go out of your comfort zone for. You can still look classy and stylish while sporting the latest bold fashion of Vera Bradley’s spring collection. Spring fever is definitely in the air and there’s no better way to celebrate the season than with these bags from the Vera Bradley spring collection. Whatever mood you are in, the colors and patterns of these bags will surely make your outfit more colorful and vibrant. It will just all come down on how you mix and match. The possibilities are endless. So, what are you waiting for? Get something for yourself or surprise someone with these fresh shades and take pleasure in choosing your favorite bags in stores near you.